HSSC Group D Admit Cards 2018: The Haryana Staff Selection Commission is all set to release the second batch hall tickets, on its official website— www.hssc.gov.in. The HSSC group D admit cards are for the second batch examination which will be conducted on November 17th and 18th, 2018. Below are the steps to download the HSSC Group D Admit Cards 2018. HSSC Group D Admit Cards 2018: The Haryana Staff Selection Commission (HSSC) is all set to the release the group D admit cards for the second batch examination which will be conducted on November 17th and 18th, 2018. The candidates can download their admit cards, once they are released from the official website of the Haryana Staff Selection Commission @ hssc.gov.in. The HSSC is likely to share the hall tickets by this week. A few days ago, HSSC had released the HSSC Group D Admit Cards 2018 for the exams scheduled November 10 and 11. 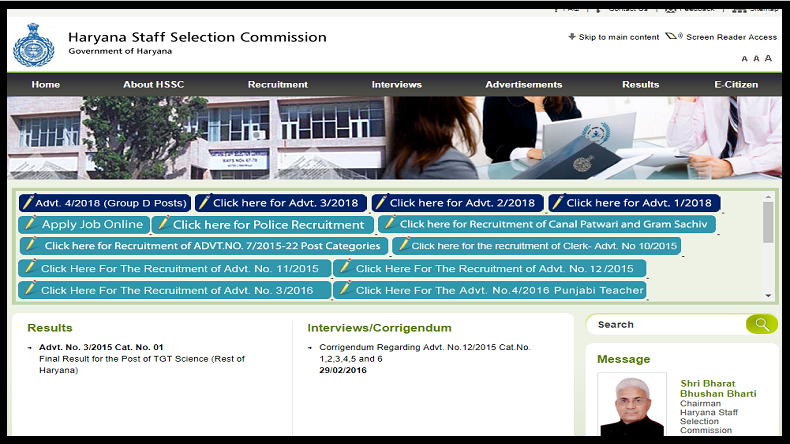 The aspirants are advised to the visit the official website of the Haryana Staff Selection Commission (HSSC)—hssc.gov.in for further details. Haryana Staff Selection Commission (HSSC) has invited the applications for several posts in the state government departments. The online process for the HSSC group D recruitment 2018 started on August 29, 2018, and now the exams are being conducted. The HSSC Group-D exam will be conducted for 90 minutes, in which, the candidates have to answer 100 Multiple Choice Questions (MCQ). As per the previous exam papers, all questions will be related to General Awareness, Reasoning, Math, Science, English, Hindi history, current affairs, literature, geography, civics, environment, the culture of Haryana. Step 2- Click on the link for HSSC Group D admit card. Step 3- Submit the required details like name, fathers name, date of birth, registration ID and password. Step 4- Admit card will be displayed on your screen.